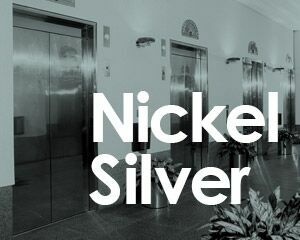 Consistently, the team at Mac Metals is asked what features make Nickel Silver superior to Stainless Steel for elevator sill applications. Although we know the top reasons, we would like to bring you the top reasons from a secondary source. For reference, nickel silver may be referred to as Alloy C77600 and stainless steel as S304. Nickel silver exhibits a distinctive soft silver hue, color tone, especially when polished closely resembles that of sterling silver. S304 exhibits a harsher gray tone. Nickel silver is extremely close to S304 in tensile (91ksi, 629MPa) and superior in yield strength (47ksi, 322Mpa @ .2%offset) compared to S304 (Tensile 90 ksi, 621 Mpa) (Yield 290MPa, 42 ksi @ .2% offset) yet are much more workable, facilitating manufacturing processes. The mechanical properties of nickel silver are sufficient for loads commonly associated with this application. This is substantiated by the excellent real-world performance of this alloy supplemented by the fact that alloys of even lower yield and tensile strength of alloy C38500 (architectural bronze). Rockwell Hardness of nickel silver on the B scale is 83 vs. 82 for S304. Nickel Silver is easier to extrude and can thus be extruded in thinner sections. As a result, although the density of nickel silver is slightly higher, less material is used in each section, resulting in a lighter component. To enhance the ability of nickel silver to be extruded are the alloying elements of zinc and (to a much lesser quantity) lead. Both have lubricity properties and enhance extrusion. The superior lubricity of nickel silver can provide lower wear on associated components (nibs, gibs, wheels, etc.). S304 contains chromium as an alloying element for high temperature oxides that are abrasive. This causes increased tool wear and resistance to extrusion. Nickel silver is easily joined at a lower temperature. Nickel silver is easier to polish to a high gloss. Thanks to Larry Peters and Jim Michel from CDA (Copper Development Association) for their help in the article. This article originally appeared on the Mac Metals Blog on July 2, 2013. We welcome your comments and opinions on the comparisons and differences between Stainless Steel and Nickel Silver in elevator sills. We also invite you to view our newly improved gallery featuring our work across the United States. Mac Metals, Located in Kearny, New Jersey, is a provider of custom extrusions of brass, bronze, and nickel silver to architects and hardware manufacturers across the globe. we welcome you to read through the Bronze Blog, register of our Alloys E-Newsletter, and contact us for more information.